Lord of heaven, we come to worship and celebrate you. For in your wisdom, grace and mercy you sent us Jesus, the Savior of our souls. Lord, though no gift would ever be enough to show how thankful and grateful we are, we humbly offer you ourselves. Right here. Right now, as we worship the King of Kings, we give you our hearts, minds and faith. With you in our lives, we proclaim to the world that you are the loving God of all creation. Here are some pictures from our 1st bi-annual Christmas Eve all family (except Daddy) sled: Hey look: I managed to get 2/3 of the children to look at me and smile! Cody is digging in the snow. I'm not sure why. This is an action shot. Believe it or not. Caleb got fed up with the cold and decided to walk home. And here's a bonus Feed My Starving Children shot. Cody's manning the chicken and veggie station while Logan is holding the bag on the funnel. I'm not sure who the kid doing the soy and rice is--that's why I didn't feel bad cutting him in half when I cropped the photo. Under the headline read: "We detest the bills, but we love the programs. Comcast [the major cable TV provider in the Twin Cities] says it's a great value, but alternatives are few. Is there really a choice?" I guess this just underlines one more way in which my values differ from those of most of my neighbors. This alarms me, that people really feel like they don't have a choice when it comes to cable, that people really see cable TV as essential. There is always a choice--those complainers just don't like any of the choices available. One more sign of the times. One more thing that makes me feel like a foreigner in a strange land. So here's a quote from the chief complainer from this article, Peggy Briarty, a 72 year old retiree: "with the stock market and the bailout on Wall Street? And they have the guts to raise their prices?" Right. Because, Ms. Briarty, people like you are willing to pay. Comcast is in business, not to provide a public service, but to make money. When you complainers decide to put your money where your mouth is, on a widespread basis, prices will fall. Why is that so difficult to understand? Those of you who know me well, know that I consider myself to be a crusader against entropy. Sometimes it seems like my entire life is spent battling disorder and chaos, and I get so tired sometimes. It is never ending, and I often feel like I am the only person in my household making an effort in that direction (I know it's not true--Scott does a fair amount of entropy battling as well). I also often feel like entropy is winning. I was, therefore, pleased yesterday, when as I was reading along in my latest mystery novel, Exit Wounds by J.A. Jance, I read these words: "Dealing with the constant barrage [of paperwork] was much like the thankless task of doing housework--it could be completed on a temporary basis but it was never actually finished." Finally, someone who understands, even if she's only a fictional character! Just wanted to share part of the conversation Logan and I shared this morning, as he was standing by the Christmas tree, checking out the gifts that appeared there yesterday. Me: Do you know why we celebrate Christmas? M: Because it's Jesus' birthday. L: Oh...yeah [giggle]. But that's so sad. L: Because Jesus can't come. He's invisible. M: Well, that's the nice thing. All you have to do is ask Jesus to live in your heart and then He will always be with you. M: Do you think we should have a cake for Jesus? L: No. Cupcakes. [pause again] But Jesus can't have any. He's invisible. M: Well, maybe we can have one for Him. He's a thinker, that Logan. Logan lost his first tooth this morning. Don't worry--he found it again. The question remains, what can I, a lowly, imperfect, unworthy human, give to the One who gave me everything I have? What could I possibly have, that God, Creator and Sustainer of the universe, could want? This Christmas, we, along with my husband's family, bought gifts for a family we don't know, who are unable to buy their own Christmas presents. We did this because we are Christ-followers, but is this really a gift for Jesus? We tend to give more money to charities around Christmas time as well. We do this because we are Christ-followers, but is that really a gift for Jesus? I suppose, based on Jesus' words in Matthew 25:40: "I tell you the truth, whatever you did for one of the least of these brothers of mine, you did for me," we can say these gifts are for Jesus, but I think what Jesus really wants for His birthday is...us. Our very lives. Our hearts, minds, and souls. Everything we have and everything we are. As Margie Palatini wrote in Mooseltoe, it's "so simple. So easy. So...perfectly perfect." Right? So, my friends, what gift will you bring to Jesus this Christmas? What are you gonna give the Guy who has everything? Here's what Caleb looked like when we returned from the bus stop this morning. And, by the way, he did not eat his socks today--he couldn't get to 'em. Have you ever noticed that the little scissors picture on the box tops for education coupons is oriented for a left-handed person? No, you probably haven't noticed. Well, it is. It always bothers me a little bit as I cut in the opposite direction than that indicated by the scissor icon. So remember when I said, "I'm not sure how they could mess that [a blank something for me to personally personalize] up?" Well, they managed to mess it up. Now I have 4 (or maybe it's 5--I've lost count) personalized somethings all misspelled in the same way. I haven't called yet this time, because I'm a little afraid of what I might do or say on the phone, like burst into tears or start screaming at the poor customer service person who has the misfortune to answer my call. I also am not quite sure what I want them to do to make this up to me. I really, really don't want 5 (or 6) of these things. I just want one. Actually, I don't even want one--I want someone else to have one. The thing is, because of the way it's written, the incorrect letter can easily be changed to the correct letter, especially on two of the somethings. Part of me says, "let it go. Just change it on one of those and give that to the person." The other part of me says, "no, I ordered a personalized something. I spelled it right. They are obligated to give me what I ordered." I love going to the mailbox at this time of year, because the Christmas cards are arriving. It's always nicer to go to the mailbox when there's mail in actual envelopes addressed to us by name that is not someone telling us to pay up. We used to send our Christmas cards out the day after Thanksgiving, but those days are long past. There are too many other things going on in my life to devote time to Christmas cards that early in the year. It looks like no one else is sending their cards that early anymore either, at least among our friends. I have one complaint about Christmas cards, and I'm not sure that I should mention it in this space, because I'm planning to include my blog address in our Christmas card this year, and someone might be offended, but oh well. Caution to the wind (which is quite nasty today) and all that. The problem I have with Christmas cards is the ones on which the people just sign their names and send them off. For many of the people with whom we exchange Christmas cards, this is the only time we hear from each other all year. I honestly feel like, what's the point in sending us a card if you're not going to take the time to tell us how you've been? Yes, from your card we can tell that you're still alive. We can figure out if you've moved to a new location. If you sign an additional name to your card, it's a pretty good bet that you've added a new person (or sometimes dog) to your family. But if you're getting a Christmas card from me, it's because I care about you, and if I care about you, I want to know what you've been up to, how you're doing. (Let me add that I really don't mind when those of you with whom I communicate regularly just sign your names to your cards, because I know how you've been and what you've been up to--it's just the people that I don't hear from regularly). Christmas newsletters get a bad rap, I think mostly because people tend to share only the good stuff in them, making everyone's lives seem incredibly, overwhelmingly wonderful, and sometimes sounding boastful, but I love 'em. I just lap them up. Can't get enough of them. Read them multiple times. Because it makes me feel connected to the sender. And that, my friends, is the point of sending Christmas cards, at least in my mind: connecting with friends and family, and rekindling those relationships that have been neglected all year. and we watched the Survivor finale (I called it--Sue won the last immunity challenge). Now today, it was 7 degrees below zero when I woke up, and the wind chills are in the 20-30 degrees below zero range. The high today is supposed to be -1. Bracing. Cody recently received a chemistry set as a gift, and decided to do the experiment where you use vinegar and baking soda to blow up a balloon. The kid is hooked. He now tells me that he wants to be a scientist (in the water, so he can still SCUBA for a living) when he grows up. What this book suggests, that I don't recall ever doing before, is after you fill the balloon with the CO2 from the reaction, fill two other balloons with regular air and helium, and then compare them. We noticed right away that the CO2 balloon was much heavier than the room air balloon. We didn't actually fill one with helium, but we know from prior experience that it would have been lighter. We also noticed that the balloon got really cold as it filled with CO2. That makes this an endothermic reaction. I always thought it was exothermic (meaning that it gives off heat), probably because when people are making model volcanos, this is the stuff they use for the lava (see, I remember a little more p-chem, but I'm pretty sure I don't remember it from Leslie Leifer's class). I'm so glad that Cody is curious and interesting in finding out more about how things work. Yes, he's cleaning the table with one of his many toothbrushes. He's not strong enough to pull the chair away from the table, so he gets stuck. Hey--those of you who receive my blogs via email, go to my blog webpage to view a video of Casting Crowns singing their beautiful Christmas carol, I Heard the Bells on Christmas Day. Reading the words is powerful, but listening to it will give you chills. Just scroll down to the end of the entry entitled "The Hunt." Our family is feeling better. Logan and I started throwing up within half an hour of each other on Saturday, so we're really all done now. I'm really glad that I got sick on Saturday (as opposed to a week day), because it gave Scott a chance to do my job for a day. I think we've both come out of the experience appreciating each other more. One of our favorite parts of getting ready for Christmas is going Christmas tree hunting. Here are some of our pictures from our successful outing on Sunday. After we returned home, we turned on the Christmas carols, ate popcorn, and drank hot chocolate to celebrate our successful hunt. Everyone was eager to help put our trophy on display. Here is Caleb explaining the best way to get it in. When I talk to the customer service people, they all sound so apologetic: "oh, I'm so sorry to hear that," they say. I try to comfort them, or at least make them feel not as bad, or maybe just demonstrate my own good-will and lack of animosity by telling them, "well, I think it's more commonly spelled that way," but now that I've thought about it some more (and believe me, I've thought about it), I really don't think that's the case. They're just not paying attention. Now the big one is sick. We're in dire straits around here, because my husband never gets sick. This morning as the four youngest members of our family were sitting around the breakfast table, the oldest child (AKA patient 0), said, "so, who's next?" The middle child and I looked at each other and together exclaimed, "not me!" So, it's settled. No one else is getting sick. Here's a picture of Caleb in happier times...if there's something to climb into, he'll climb into it and give us this big proud grin of accomplishment. Now the little one is sick. In the range of normal every day non-life threatening kid sicknesses, there's not much that's worse than a vomiting child who can't or won't aim for a bowl. Unfortunately, I must now give up any pretence that the oldest child was a victim of food poisoning (I was hoping really hard): it's just a matter of time until the middle child gets sick, too. So I ordered a personalized something for someone for Christmas, and they've spelled the name wrong the same way twice now. They're putting a rush on it for me this time. They really ought to put a spell-checker on it this time. I always thought that they had more than one person checking those things before they leave the warehouse. If that's true, at least 4 people have made the same mistake. If it happens again, I'm just going to have them send me a plain one. I must say, though, customer service has been excellent. We had a little bit of excitement around here last night. Cody was home sick from school on Tuesday, vomitting, but felt well enough to go to basketball practice. And he was fine, until about 15 minutes in, when he fainted and fell chin first into the floor, opening up quite a gash, and causing his ear to bleed. Well, three paramedics, a random racketball player, several basketball parents and YMCA staff, three nurses, one doctor, an EKG, blood tests, IV, cat scan, chest x-ray, and four stitches later, he's fine. Wants to go back to school. You can see the bandage on Cody's chin, plus some EKG leads, the IV spot in his arm, and the hospital bracelet. I took a picture of Cody's stitches, too, but it came out blurry, and that's just a bit too graphic to include, I think. Cody wanted me to take a picture of his bloody shirt. This happened less than 2 miles from the emergency room. Both Scott and I were in town and present at the time. It was Cody rather than Logan or Caleb (neither of whom would have handled it nearly as well) who got hurt. It happened in 2008, so we still have a chance of not meeting our (huge) medical insurance deductible for three years in a row. We have medical insurance, so we will enjoy discounts on Cody's care, and we've met our deductible for 2008, so we won't have to pay 100% of the remaining cost. The doctor was great with Cody. The nurses were, too. Darcy was home, answered her phone, and was able to come pick up Caleb and Logan and take them home with her. Cody seems none the worse for wear, and he'll have an interesting story to tell. So have you seen the new Monopoly game? I know, there are scores of them, but I'm talking about the new cashless version. Evidently you use a credit card-like thing to keep track of your money electronically. You know, I have never enjoyed playing Monopoly (I do enjoy the junior version that we have), but to me it's worth playing to get some practice adding and subtracting and handling and investing money. It is beyond me why anyone would want to play the game for any other reason, such as, it's fun. But the new cashless version takes that away. I see it as both the death of a fine tradition and as a sign of the times...I am just a dab horrified (horrified is too strong a word, but the children have stolen my brain cells, so I can't come up with anything better right now), but mostly just feel sad and compelled to shake my head. I have been unemployed for over 9 years now, and as you can imagine, I've spent some time thinking about how to make my re-entry into the working world. I have already determined that I don't ever want to work full time again. I actually had that figured out while I was still working. I've determined that whatever I do, it'll either have to be tied to the school year, or it'll have to be something that I can do from home and that I can do as much or as little of as I wish, depending on how much is going on with kids. That is, at least until 2026. So at times I've thought that I might enjoy being a medical biller. I'm told (by the scores of advertisements that I've gotten through the years) that I can make up to $40,000 a year at home (right). I enjoy working with numbers, computers don't intimidate me, and I actually find filling out paperwork to be calming, plus it's definitely a growth industry. What better job could there be for me? About 6 weeks ago, during the course of a doctor's visit, my middle son was required to pee in a cup (don't worry, everything's fine). Let me just say that this is one more reason I'm glad we have boys instead of girls. So a couple of weeks ago, we got the Explanation of Benefits back from the insurance company, and found that there was a charge for the office visit, and two separate charges for the lab. Now, I can understand a collection charge and a separate analysis charge when the lab workers actually do something to collect the sample, for instance, when they draw blood, but come on, people! I was the one holding the cup for the kid. The really silly part is the fees were the same for each charge: $15, but the allowable amount for the collection fee was $10.50, while the allowable amount for processing the sample was $3.50! You'll notice that the two together just about equal one $15 charge, which it should have been in the first place. I complain about how expensive our medical coverage is, but I am so thankful that we have medical insurance, or we'd be paying double. We had similar issues with all of the late term ultrasounds we had for Caleb: separate (huge) charges for procedures that had a marginal cost of zero. They also charge an administration fee for immunizations in addition to the charge for the immunization itself, and it's not just an administration fee, it's an administration fee for each separate shot, regardless of how many they're giving the poor kid (we've had combined administration charges of over $100 in one office visit--makes me wonder if the nurses are paid by the shot). So this all has me thinking that medical billing may not be the best career choice for me. I think I would object to the ridiculousness of the charges, and I find it difficult to keep that kind of thing to myself. My sense of justice and fairness would always be filling me with disquiet, and who wants to live that way? So, I guess I'll have to come up with something else...good thing I have a little time to decide, eh? Any suggestions? Here's a picture of Caleb with his favorite toy. It's a toothbrush, just in case you can't make it out in the picture (or you can't believe what your eyes are telling you). He has several of them stashed in various locations throughout the house, so he'll never be far from a toothbrush. Actually, it doesn't have to be a toothbrush: any long skinny implement will do. He's particularly fond of rubber scrapers and drumsticks, although toothbrushes do appear to be his favorite. He doesn't actually start his dance moves until the 15th second or so, when he's standing by the "coffee" table. Don't blink--you might miss it. I think he was hoping for some different music. My brother told me to stop telling people about his weather. I'd like to point out that I've been very careful to not state his location, so that people won't flock there, or stalk him, or whatever. And you know, now I have to tell everyone your weather. They've come to expect it. High of 66 today; 38 tomorrow. Fickle. What do you mean when you say maybe? When I say maybe I mean just that: maybe. It could go either way. Maybe yes, or maybe no. Can't really make a commitment at this point. I've learned, after 13+ years of marriage, that when my husband says maybe, he really means yes. As is, maybe I will have another slice of pie. Scott doesn't really have a substitute for maybe in his vocabulary, either. Very black and white, that husband of mine. I must admit, I take a certain stubborn glee in continuing to interpret his maybes as maybes. In the previous case (the piece of pie), I won't bring him another piece of pie until he revises his maybe to a verbal yes. I have always (as much as I can remember), been a face value kind of girl, perhaps even a little gullible. When people speak to me, I expect them to say what they mean, and I believe that they mean what they say. Not very female of me, is it? I was blindsided this week, though. Someone other than my husband told me maybe, and I believed her. I thought, OK, we could go either way on this one. I choose no. Later on I found out that her maybe was really a yes. Thankfully I still have time to remedy the situation. One of our pastors is fond of saying something like, "so let's let our yes be yes," usually in reference to taking the offering (if that doesn't make sense to you, don't worry--it's OK). I think there must be something like that in the Bible somewhere, given the frequency with which she says it. I feel like we should let our maybe be maybe. OK, folks, it's time to get serious about this windscreen: the ducky blanket just isn't cutting it. One of you is working on this, right? Want me to send dimensions, or were you planning on making it one size fits all? That might be more marketable. Oh, and forget the insulation, just go ahead and heat the stroller. By the way, my husband complained that my specifications yesterday were contained in a run-on sentence. Nope. There was, however, a sentence fragment that would have made Miss Hargrave grit her teeth and roll her eyes (just in case you're not my brother, that would be my 8th grade English teacher), if she had had the displeasure to read it. I apologize. I just didn't feel like including a subject or verb in that non-sentence. So there. At least I didn't dangle any participles. Seventy-six degrees for a high today where my brother lives. That is so funny, because a common complaint I hear about where my brother lives from people who don't know what they're talking about is that it's way too cold and way too snowy there. Humph. I think they just know how to do it right there. It snows, but usually melts by lunch time, and if they do want to play in some snow, they can find some, pretty much year-round. It does get awfully hot during the summer, but again, all they need to do is gain some altitude and it's not so bad. Here, it's cold. Just what you would expect for mid-November (OK, a little colder than you would expect...well, maybe you would expect it, but a bit colder than those of us who live here would expect). I forgot to put my long undies on this morning, so as I was walking, my top half was sweating again, and my bottom half was numb. Aren't you glad you know that? Make that a windscreen, that's see-through, waterproof, insulated, and automatically darkens if the Bubby falls asleep. Also securely enough fastened that the Bubby won't be able to kick it off and under the wheels of the stroller. The bus stop windchill this morning was 10 degrees, and I was sweating on my walk! AND where my brother lives they're supposed to have a high of 66 degrees today! Severe weather alert and 33 degrees where my in-laws live. That's more like it. Here are some of the things we saw while walking this week. Willy and his owner--of course I don't remember her name. The standard poodle Willy's owner is always telling us he was playing with, out (for the first time ever), and barking at us. He does exist. The collie and shepherd looking dogs, across the road from the poodle, not barking at us. I guess they've gotten used to us. A car pulling out of the driveway of the house where they generate their own electricity. Yes, it was a Prius. An alpaca! Who knew there was an alpaca living within 2 miles of us!?! A deer in one of the fields north of us. It watched us walk down the hill. A man carrying a compound bow in a different field north of our house, looking down. I didn't know anyone hunted anything small enough that he would be looking down for it, with bows. We did not point out the deer to him. A pair of red-tailed hawks roosting in the same tree where we saw 100s of yellow finches in the late summer/ early fall. I wonder if hawks eat finches. The house with the 4 car garage that always seems to have 3 cars parked outside with one of its garage doors open. And nope, there wasn't room in there for a car. Geese, finally flying south, in a perfect enough V that Logan noticed it was a V.
Here it is...the long awaited video of Caleb eating cake. He doesn't seem all that excited about it, does he? Let me just start by saying I am so thankful for our dishwasher. Every time I put a dish in there, I say a little prayer of thanks, that I have this work-saving device. I'm thankful for our washing machine and dryer, our air conditioner and furnace. Running water. All that stuff. When we first moved to West Virginia, we didn't have a dishwasher, and that was definitely not a deal-breaker in our minds. After all, there were only two of us then, and one of us didn't even have a job--I could have washed dishes all day, and I would have been happy to, although I'm sure my hands would have protested after a while. Then, we had a baby. And suddenly, I didn't have all day to do dishes anymore. In fact, I didn't have 5 minutes to do dishes. In fact, I didn't even have to time make any dishes dirty in the first place. I distinctly remember being awake at 2 a.m., feeding Cody, and Scott would be washing dishes or mopping the floor. Eventually, Cody didn't need as much hands on care, and I was back to having time to wash dishes, but we promised ourselves that if we ever had another baby, we would get a dishwasher first. Fast forward to November of 2002. I was pregnant with Logan, AND we had guests coming for Thanksgiving. Enter the dishwasher. I remember looking at the energy usage label, and chuckling to myself, because they based the energy usage figures on 5 loads of dishes per week. I thought, who does five loads of dishes a week? That just seemed excessive. At the time of installation, we did one load of dishes about every 4-5 days. Fast forward to November of 2008. Now we have three kids, and a different home with a different dishwasher. And guess what? I'm one of those people who is running her dishwasher 5 times a week. I still find it hard to believe that anyone would have to run their dishwasher 5 times a week. For a good three months now I've been telling myself that it must be only temporary, all these dirty dishes. I don't know where all the dishes come from (well, I'm pretty sure they come from our cupboards)... So, yes, I am very, very thankful for our dishwasher! Well! I just want you all to know that Fleet Farm is THE BEST store ever. You can purchase just about anything there--just about anything our family would purchase, anyway. They've got fishing supplies, boating stuff, exercise equipment, tools, hardwear, car stuff, clothes and shoes, bird supplies, home stuff, and even the vacuum cleaner belt that I couldn't find anywhere else, including Sears, where we bought the vacuum. And fuzzy pink slippers! What more could you want? Right now, they have a great selection of toys at good prices. For instance, the other day I bought 3 of a particular regular priced item at Fleet Farm for less than it would have cost me to buy 2 of that same item at Target. Granted, they don't have the Shake-n-go Mack Hauler with Radiator Springs Lightning McQueen at Fleet Farm, but they do have the #48 Jimmie Johnson hauler with race car, and you should see their selection of John Deere items! And big metal Tonka trucks of various varieties (not just the dump truck). And a Caterpillar Megabloks dumptruck. I told the cashier I was going to do all of my toy shopping at Fleet Farm from now on. They have cute Christmas decorations, too. I saw it for myself today. Gas was less than $2 per gallon in Stillwater. I honestly didn't think it would ever go below $2 again. Whew, I was sweating today on my walk. I must admit, though, I believe it had more to do with the temperature outside than with my exertion today. So yesterday Caleb walked all the way to the bus stop to welcome his brothers home. This led me to think, and Cody to say, "we need to get that kid some shoes." So this morning, off I went to our basement storage area, which is the first place I go when we need some new clothing item for any of our kids, to look through the available shoes. As I had suspected, Caleb's feet are too big to fit in our size 4 shoes (which means that he has big feet like his mama, poor kid). I found a pair of size 5s, which did fit, but Caleb didn't quite know what to make of them. He definitely couldn't walk in them, so he ended up staring at them for a while, as if to ask, "how did those get there?" I took pity on him and took them off, allowing him to head to the bus stop in his slippers again. Eventually he's going to have to learn to walk in shoes, but it doesn't have to be today. We've been getting a lot of political flyers, leaflets and phone calls lately. I have to admit, I find this a little amusing, because IT'S TOO LATE. My husband and I have already voted, via absentee ballot. And I would take selfish pleasure in telling those people on the phone that, too, if only they weren't recordings. Speaking of phone calls, his alma mater is trying to get ahold of my husband. They've called about 5 times, now, all at 8 p.m. Now I'm thinking that the reason they do this is because my husband is first on the list by virtue of his last name being alphabetically near the beginning, and up until 8 o'clock, they're calling all of the alumni who live in the eastern time zone, and then at 8 they switch to those of us who live in the central time zone. Now honestly, can't they figure out that 8 p.m. is not a good time to call? So this engineering student is sitting at his computer terminal with his little headset on, and it's 8 o'clock. He sees that Mr. S.B., BS ChemE, is first on his list and he thinks, "let's see, we've called this fellow at 8 p.m. five times now, and every time, we've either gotten his answering machine or his wife telling us to call back in half an hour because he's busy putting the kids to bed. Huh. Let's see if he's available." And I would ask if I would be a good enough substitute, but Scott always has better questions for the poor kids who draw the cosmic short straw and end up calling us. One time, the poor student called when there were 8 or 9 members of AZD in our house. And speaking of time zones... Why? Why do we put up with this daylight savings time nonsense? I've heard that the reason we do daylight savings is because it saves money on energy costs, and that the reason daylight savings time has been extended now is because it's saving us even more money. So my question is, why don't we just stay on daylight savings time all the time? Time is a relative concept anyway, so who cares what time we call it? And speaking of time...time for me to do the laundry. My brother was right, as he often is. Here's the video I was trying to post when I had to leave the library yesterday. And, Eric, I kind of thought this would be the case, but one other time I tried leaving and posting at home and the darn thing was still processing several hours later--I guess there was just a problem with that one. I can't upload another video while one is processing, but that may be because I try to do it in the same post--I'll try doing it in a separate post next time. Now I think I'm going to go back and see if I can get Cody's video on to the blog. It's uploaded, but I cancelled the processing so I could move on. I cannot believe that I have been logged in to this computer for 55 minutes. Guess I waited too long for Cody's video to process. I'm going to be kicked off in less than 5 minutes...oh, how nice, they extended me because no one else is waiting. This is kind if ridiculous, though. Why does it take so long? So I made it after all. Who needs an afternoon nap, anyway? And of course I decided to lead with the largest video. Know what's kind of funny? Yesterday Cody and I were talking about home row on the keyboard (he's learning typing in 3rd grade), and I realized that I really don't know cognitively where the keys are. That is completely motor memory. I was like: I know it's a-s, but I don't know what else! I think g and h are in there somewhere. He was saying e and r and I thought those were in the top row, but I wasn't sure. I always kind of wonder what people are thinking of me when I sit down to the computer with my little one and plug my little jump drive in. I always wonder about the people sitting next to me, why they're doing this here instead of in the comfort of their own homes. The past couple of times the chick next to me has been updating or admiring or whatever it is one does with her facebook page. Wow. Processing is taking a long time today. Of course this is the longest video I've attempted to upload. Cody just had lots to say. And it's amazing how much stuff there is in a library that little boys really shouldn't touch, especially here on the adult side. I wonder how long I should wait before I should just give up? Here's what Cody said, "I like really that he can pay for our house so that we have somewhere to live and then I also like that um he lets me go fishing with him and he lets me borrow his kayak sometimes and that um he loves me and that I love him and he buys basically all my toys. See? This is Bumblebee, my favorite transformer. Say hi." I had some great videos for you today, but unfortunately, it's not going to happen. Well, maybe. We're not going to story time today, though, so I don't know if we're going to make it in to town at all. The lights in our kitchen are acting screwy. By that I mean that the one above the sink won't turn on at all anymore, and the main kitchen light goes on and off as it pleases, totally ignoring my use of the switch (as an aside, does anyone know if CFLs are supposed to get hot when they're on? I kind of thought they weren't supposed to, but when I've jiggled the bulb in the kitchen to see if I could get it to turn on, it's been warm, which seems like it could be an additional symptom of the problem). So, it's hard enough for me to get motivated to cook supper each night. That time between when the older kids get home and supper is my busiest and most stressful time of the day. It's even harder when Scott's not home, because I know that I'm going to hear displeasure about my choice of entree from at least 33% of our children, and who wants to hear that every day? But when it's dark in there, too? Forget it! I am a vanishing breed. I don't have a cell phone. Even my parents have a cell phone. I've never really wanted to be that available. In fact, unlike some people, I have no trouble at all letting my answering machine answer the phone for me when I'm busy or even just don't want to talk to anyone. And to be honest, having a cell phone seems like an unnecessary extravagance, and to be honest again, I don't know that I'm willing to give up any of the other things that I spend money on (like food, electricity, our house...) to make room in our budget for that. It's interesting to me how so many see a cell phone as a necessity, when human kind has survived for centuries without them. I guess that's the way it is with any new technology. At first, it's novel, and expensive, but as time goes on, these things become a part of our culture, and somehow we start saying things like, I don't know how I ever survived without my .... whatever it is. Something bugs me about cell phones. People talk on them all the time. It's as if they're afraid to be alone. At one of Cody's soccer games, I watched one of the other parents get out of her vehicle talking on her cell phone, walk over to the field talking on her cell phone, and spend the entire time that I was there (about half an hour before I had to leave to take Logan to his game) talking on her cell phone. I've seen parents pick up their kids at school doing the same thing. Parents talk on their cell phones at the playground, instead of watching their kids. And perhaps you've seen the commercial for Velveeta where the mom and her son are traipsing through the grocery store, and the mom is cutting everything in half before putting it in her cart? She's yakking on her phone the entire time. Do these people really think that being physically present is good enough? Yikes. They're so busy communicating with all these faceless people on the phone that they don't have enough time to communicate with their own children face to face. You hear about distracted driving. I call this distracted parenting, and it's dangerous. Here are Cody and Logan with their soccer medals, and Coach Scott :-) Taken Saturday. Despite appearances, Caleb is not falling, in this shot :-) This was taken Tuesday (today for me--who knows when for the rest of you). Doesn't he just looked thrilled with himself? I love it. I can see why they call children of a certain age "toddlers," because that's exactly the right name for what that baby of ours is doing these days. He's got the wide stance, the arms up, the huge smile on his face...He is walking all over, and likes to chase his brothers, too (you knew that was coming). I wish I had a picture to upload, but I don't, and I'm not about to wake Caleb up to get one :-) It just puts a smile on my face to turn around and see that cutie pie lurching down the hallway after me. There's a house on my extended (3 or 4 mile) walking route that has a windmill and several solar panels in its back yard. I have often wanted to stop and ask the inhabitants how much of their household energy they are able to produce themselves, but knowing how I would react if someone I didn't know knocked on my door at 8:30 in the morning, I've never stopped. A couple of months ago I told Scott that we should hook up a bike to our TV so that if we want to watch TV we have to produce our own electricity. I think he thought I was joking. One of the TV stations in the Twin Cities did that during the MN State Fair--they had several bicycles hooked up and passers-by could take a turn powering the broadcast. 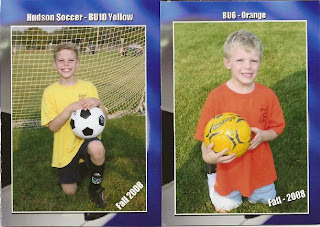 Saturday was Cody and Logan's last day of soccer for the fall. I'll post a picture sometime. Logan was really excited to get his medal--he kept telling anyone who would listen that his coach gave him his first. We also signed them up for basketball on Saturday--that's Tuesday evenings starting in November. One of my favorite things to do with Cody is shoot baskets (for those of you who don't know, my children gave me a basketball for mother's day), so it'll be fun for him to learn techniques or whatever they're gonna teach them. I'm sure Logan will have a good time, too. Thank you to those of you who bought popcorn from Cody. He has met his goal of selling at least $400 worth, and he's one person away from having sold to 25 customers--he gets a free waterpark pass if he does that. Be aware, though, that it's easy to "cheat" on this one. Let me share a few insights on love. I know that you all already know this stuff, but it doesn't hurt to be reminded, right? So first of all, love is a choice. That means that every day I can choose whether I will love my husband, my kids, the rest of you all. How do I make that choice? Well, here comes the second nugget of wisdom: love is an action. That means that love is something you do. We can show our love through what we do and what we say and how we listen and how we choose to react and behave. And why would we want to show our love? Because if it's not showing, how does the person know he or she is loved? And if he or she doesn't know that he or she is loved, are you really loving that person at all? If you take the assessment, please let me know what it said about your love language. And here's the bi-weekly update on hearing God's voice. I've already told you that God's voice has authority, is compassionate, and is true. That's how you can know that the messages you're receiving are of God. So, one of the ways God speaks to us is through disciplines: scripture, prayer, fasting, and worship. Of these ways, which is your favorite? Or which have you found to be the most effective in your life? Scripture: Isn't it amazing that this book that was written thousands of years ago can still be relevant this day? That's because the words are God's words, inspired and holy. Have you ever gone to scripture seeking God's voice and not heard it? Prayer: I realized, when reading this section of Jen Hatmaker's book, that I don't really listen when I'm praying. I don't expect an instantaneous answer. I approach prayer more like snail mail than a phone call, as in, I send off the message and I know that God will get the message and respond at some point, but I don't expect it to be right then. I think I need to expect that more, or at least be open to an instantaneous answer. I wonder how many times I've missed hearing God's voice because I've moved on to the next action item in my prayers. Fasting: Most people have bad impressions of what fasting is. I think most people see fasting as a self-denial kind of thing, that you do for God, because you think it will please God. I think of fasting as making space in your life to hear God, which, yes, pleases God, but you can see the benefit for yourself as well. If you give something up, something that you've promoted to essential status in you life, you can see that really, God is what is essential. God sustains us. In my life, I have felt the closest to God when I have been fasting, and it's because of that reliance on God to provide for all of my needs and to sustain me. And before you start telling me that you can't fast because you get huge headaches when you don't eat, so do I. It doesn't have to be a food fast, or if you do choose a fast from food, it can be modified. You can eat rice instead of your regular meals, or even just give up one food item or refrain from snacking between meals. Ms. Hatmaker says that fasting can be a way of initiating contact with God when you urgently seek His voice. Worship: I think when most people think of worship, we think of going to church. And that's an important place to worship and an important powering-up for the week, but Ms. Hatmaker points out that each of us is God's temple. God meets us where we are, and that makes each of our lives a holy place. How does that make you view your life differently? How can we engage in continuous worship? 1. I don't understand how Senators Obama and Biden can, with a straight face, say "it's only fair," when referring to making people earning more pay a higher percentage of taxes than those not earning as much. If they're interested in being fair, why don't they abolish the current tax system and go with a flat tax? It's not that I'm against redistribution of wealth--I do quite a bit of that myself through giving to charitable organizations. I just think the government has no business doing it. That is a choice that I make, and everyone should have that choice, including "rich" people. 2. I don't understand how Senators Obama and Biden can think that taxing oil companies more is going to make gas prices go down. Their own characterization of "big oil" is that they are greedy, money grubbing, rich guys. So what makes O and B think that all of a sudden once their administration is in place, big oil is going to say, oh, yeah, we see your point. I guess we won't charge as much for our gasoline anymore because our profits are excessive. I don't think so. That windfall profits tax is going to be coming out of my pocket and yours. So either O and B are not very smart, or they're lying to us--you decide. 3. Watching Joe Biden, it just seems to me like he doesn't really buy in to Obama's platform. If the guy's own running mate isn't confident, why should we place our trust and our future in this guy's hands? Have I mentioned that I love my husband? I really appreciate all the hard work that he does to support our family...not only his paid job, but everything that he does for us around here, too. So I'm going to this Mom's group at a nearby church. It's so nice that I can leave the house at 9:22 a.m. and still be on time for the 9:30 meeting after dropping Caleb off in the nursery! We're reading the Five Love Languages book by Gary Chapman, and I think I'm the only one who gets it (my, isn't that conceited of me). What really tipped me off is when I said I was hoping to find out what my husband's love language is, and they all looked at me as if I had said something really strange. I mean honestly, girls, the subtitle of the book is "How to Express Heartfelt Commitment to Your Mate," not, "How to get your husband to do what you want." And if you know anything about husbands, you know that the way to get your husband to love you the way you want to be loved, is to love him the way he wants to be loved. Nagging does not (I repeat) does not work. So anyway, I happened to mention that I belong to a church in a far-away town (which, for the record, is only a half hour drive), and afterwards one of the women was saying I should join their church so I wouldn't have to drive as far. Using my husband as an excuse (as is my practice when he's not there to defend himself), I told her that he doesn't like the Lutheran liturgy--he thinks it's too formal. And then she looked at me and said, "so...are you Catholic?" What more liturgious Christian denomination is there than Catholic? Makes me wonder if this woman knows what a liturgy is, but it also highlighted to me the lack of diversity of churches in this area. I know of two small Baptist churches, one independent (non-denominational, so they say), one Catholic, one United Methodist, and the rest are Lutheran, of various varieties. When we lived in West Virginia, most of the churches were United Methodist, and where my husband's family lives, most of the churches are Christian Reformed. I suppose this goes a long way to explaining cultural differences in the areas we've lived. As an aside, I'm getting to the point where I think the liturgy is too formal, too, which is why I'm happy with our non-liturgious Worship. There are good things about using a liturgy, and I'm very thankful that I grew up in a church with a liturgy, because those phrases that we said over and over come back to me when I need them, but at the same time, when you say the same thing over and over and over again, you stop listening to what you're saying, and it starts to lose its meaning. And I think that's when our Worship loses its authenticity. And I've noticed that liturgies can be downright unwelcoming. First off, in churches that use a liturgy, all of the members know it and don't have to be told how to follow along, but visitors are usually left to their own devices, and get lost quite easily. Second, have you listened to what you're saying? In the WELS (Wisconsin Evangelical Lutheran Synod) church where Logan attended preschool, one of the very first things they say every Sunday is that they're horrible, unworthy, and worthless human beings who don't deserve God's love. Obviously, I'm paraphrasing, here, but that's the feeling of the passage. I don't understand why, on Sundays when they know they are going to have more visitors than members present, they decide to lead with that. If I wasn't already a Christ follower, I would have just stopped listening after that, smiled when the kids went up to sing their song, and then bolted out of there as soon as I could, never to return. Who, besides a masochist, would want to be reminded of their worthlessness every week? Now, I have nothing against confession, even corporate confession (which we don't do a whole lot of in our church), but could we please just emphasize God's love and compassion and forgiveness while we're doing it? (I think the liturgy at the church my parents attend addresses confession better). Yes, I know, none of these earthly churches is perfect, including the one we attend, because earthly churches are human organizations, and we humans haven't figured out perfection yet. Praise God that we don't have to be perfect. 24M, that's how big this one is. I think that translates to 24 seconds of video. So, does this one really need any explaination? Well, I suppose it does. You see, Scott was all sawdusty, I think from cutting up the tree that made a noise when it fell in the woods, and we always tell the kids to keep the mess outside or in the mud/laundry room, So I was surprised when Scott brought his mess in. Cody, helpful lad that he is, decided to help his dad clean up. So I'm hoping to upload 4 videos today--I doubt I'll be able to, though...this one is of Caleb storming the camera. I need a see-through windshield for our stroller, if I'm going to keep up our daily walks. It was pretty darn cold out there today with the wind blowing. I had a blanket over Caleb today, which worked to keep out the wind, but he wasn't too happy about not being able to see out. On the other hand, he did fall asleep today, so it was probably a good thing he couldn't see. This one is of Logan doing the Air Hogs rocket launcher thingy. We're running errands today, and I have 7 stops on my list, which probably means that we'll run into both a meal time AND a nap time. It's OK, we'll survive. This one is of Caleb using his preferred method of locomotion AND the other one. Wow. So far, so good. I'm going to post and then try to upload the other one--it's much longer, so if you don't hear from me again, you know I had to leave. So my question to you this morning is, what's the rock in your shoe? What is there in your life that you really ought to take care of, but you just don't want to take the time, or you feel like it's just not worth the effort? What is the rock in your shoe, and just what is it going to take to make you get rid of it? So normally during my blogging time, Caleb is sleeping in his stroller in the garage. He falls asleep during our walk. But today he didn't. Right now he is sitting in the box lid that I use to collect recyclables down here, systematically examining each of the papers before throwing it aside, out of the box. So cute (and a perfect example of something that would not be cute if my 5 year old did it). I just read Cortney and Brett's blog this morning: http://cortneyandbrett.blogspot.com/. You should read the post from yesterday (Monday, October 20), and pray for their ministry. So last night, Logan and I were playing our colored tumbling tower blocks game (right. Because I couldn't bring myself to buy the brand-name Jenga (R) game for quadruple the price), and Caleb thought that was just the funniest thing he had ever seen. When Logan or I would take a block out of the stack, he would shriek with laughter...which is the funniest thing I have ever seen/heard. And then he'd do it again when we put the block on top of the stack. The children's library is getting pretty busy. I think they have another story time an hour after the story time for Caleb's age, so we've got the folks from our story time coming out, and the next folks are here waiting. I was going to say that it seems easier to get a computer now that school is back in session, but today all of the computers on the adult side were taken, so here I am at the secret computer on the children's side that no one knows about. Even with high speed internet, it still takes a while to upload these videos. And then blogger has to "process" the video, whatever that means. Oop. There it goes. Enjoy. Here's a video of Logan sliding down the 40' "spooky slide" on Friday. We were having camera issues (seems like we're always having camera issues), or I could have uploaded a video of Cody and Logan racing down a different set of slides. I AM. That's what God said when Moses asked God what he should tell the Hebrews when they asked who sent Moses (Exodus 3:13-15). I've never really understood that name. I AM? What does that mean? This took place during the exchange between God and Moses when "the angel of the Lord appeared to him as a blazing fire in a bush" (Exodus 3:2, NLT), and I know that God is slow to anger and abounding in steadfast love, but I can't help but imagine God beginning to lose his patience as Moses gives excuse after excuse after excuse for why God should choose someone else. I imagine God saying, in a fed-up, thundering voice, "I AM," just like I would if my kids were being difficult. In reality, it was probably quite different, since God is slow to anger and all. In fact, it isn't until Exodus 4:14 that "the Lord became angry with Moses." You can read the whole story in Exodus 3 and 4 (well, not really the whole story, but the part I'm talking about). Different translations say things like "I AM who I AM" or "I WILL BE what I WILL BE," but the New Living Translation that I'm reading says, "I AM THE ONE WHO ALWAYS IS." To me this means that God is who and what God is, regardless of our perception of God. We can choose to see God any way we want: loving, vengeful, neglectful, micro-managing, compassionate. But that doesn't mean those things are what God is, just because that's what we think of God. God just is, and God never changes. I've noticed that the pastors at our church don't use gender specific pronouns when referring to God. One of our pastors always says something like "may God add God's blessing to the hearing and the something and carrying out of God's word" after reading scripture, before delivering the message. It's a little cumbersome, like when I'm trying to be gramatically correct and say he or she instead of they or his or hers instead of theirs (I had a really rough set of council minutes one time because of that). But it makes sense to me to not use pronouns for God. God is so...big and powerful and amazing and indescribable. It's impossible to explain or define God in human terms, and when we try, we fall pitiously short. I suppose that's why there are so darn many names for God, because how can we contain this God, creator and sustainer of the universe, in just one name? Do you ever listen for God's voice? In my Sunday small group, we're reading a book by Jen Hatmaker called Tune In: Hearing God's Voice Through the Static, and according to Ms. Hatmaker, God's messages have authority: they are compelling; God's messages are spoken with compassion, as a loving parent; and God's messages are true: God does not contradict God's word, The Bible. So what is God speaking to you today? And what are you going to do about it? So we had a nice weekend. The weather was absolutely beautiful, and the kids didn't have school on Thursday and Friday. On Thursday, Scott was still out of town, so the boys and I headed to Lookout Ridge, which is an indoor playground sort of near where we live. We all had a great time, and for a good portion of the time we were there, we pretty much had the place to ourselves--most of the daytime clientele need to take afternoon naps. Just one little interesting thing about our kids. Whenever they are playing with other kids, they pair up, and Cody always gets to play with the older kid and Logan always plays with the younger kid, regardless of their ages. On Thursday, the older kid they were playing with was younger than Logan, and he kept saying, "I want to play with Logan," but Cody kept telling him he had to come with him. It's that way with their cousins as well. Tyler and Cody pair up and Connor and Logan pair up, even though Tyler is closer in age to Logan than to Cody. Then we headed off to the Turkey Dinner at our church. Cody, Scott, and I worked in the pie room, and I'm telling you folks, the pie room is the place to be! a straw maze/tunnels. That was Logan's favorite part. Caleb's favorite part was also the straw maze because he got to get out of his stroller and play. He seemed to enjoy the animals at the petting zoo as well. I think my favorite part was the hay ride. I know that everyone's least favorite part was the swarms of ladybugs. On Saturday, Cody and Logan had soccer games (isn't that a good picture of Cody? ), after which we headed to a nearby state park for a hike with the Cub Scouts. It was tiring, but a good sort of tiring...and now we're back to the daily grind, and I had to cut my walk short this morning because it was raining, but it's OK, because I've still got the sunny memories of the weekend. I use All laundry detergent. It works well (and as you can imagine, as the person responsible for laundering the clothes of 3 active boys and a husband, I'm in a position to know which detergents work well), and is less expensive than the other detergent that works well. Scott also does some work for the company that manufactures All, so in a way, I'm supporting his business, and therefore our family, by using All. Lately the detergent manufacturers have been on this super concentrated kick. They contend that we are saving the environment by buying products with less packaging. Probably true. But I think it's a racket. We consumers look at that tiny little cup that they say is all we need to get our clothes clean and we don't believe it. No way could 2 tablespoons of detergent be enough to clean a washing machine full of grass/blood/dirt/various body fluid/chocolate milk stained clothing. So we put more in, and suddenly, that bottle of detergent that was supposed to wash 32 loads, is only washing 20. The Amazing Caleb, this weekend, walked the diagonal of our living room unassisted, twice! And we have witnesses. Amazing. And then, I think we've discovered Caleb's first word, because as we were walking to the bus stop this morning, Caleb dropped something and then immediately said, "Uh oh," in that cute little boy voice of his. He has said uh oh before, but this time it was clear that he knew what it meant. I just heard Caleb sigh in his sleep on the baby monitor. Awwww! I just thought I'd share with you today that Caleb is Daddy's boy. He lives for when Daddy comes home from work. He cries when Daddy leaves the house. And he's just a bit more fussy when Daddy's away on business. Miss you, Daddy! Isn't he cute, jabbering away like that? The library doesn't have speakers for their computers, and I didn't bother to put the headphones on when I watched the video there, so I didn't realize you could hear Caleb so well. That was last night, and he was pretty tired, so I think he did pretty well considering. Know what bums me out? When I get home from being gone most of the day, and there are no messages on the answering machine. It doesn't bother me that no one calls while I'm home, but for some reason I always feel a little let down when I get home and realize that no one called while I was out. Hmm. Well, that wasn't so difficult. He's a little far away, but we'll take what we can get, right? So, Caleb is awake this time, so I'm not sure how far I'm going to get with this, but I've got to at least try. At my sister in law's suggestion (she's so smart), I freecycled (a verbing for sure) for a firefighter costume, and I actually got one! It's too small for Cody, but Logan will love it. In the 45 seconds or so that I talked to this woman in the parking lot of ShopKo as she was giving me the costume, she told me that she really appreciated the scriptures at the end of my emails, that she normally would have donated this firefighter costume to somewhere long ago, but that for some reason it was still hanging in the closet, and that she had been home sick yesterday and the scripture verses came at just the right time. Coincidence? Or did God place me in this woman's life to provide hope and encouragement at just the right time? Gives you goosebumps, doesn't it? I believe the latter. It's happened enough to me both ways (I've been the person providing the inspiration and the one receiving it), that I believe this is one of the ways God speaks to us. Some would say God doesn't have time to worry about all those little details, but I believe that God cares and does place reminders in our path. I see His hand in everything. So let's go back to my purpose in life. It's to bring glory to God. Despite my shortcomings (which are huge) and my flaws (which are many), God desires to first, have a loving, two-way relationship with me, and second to use me to further His kingdom: for me to love others--to be God's hands and feet, so to speak. So each day, I live out my purpose (when every day life doesn't get in the way), by using my life to point to God. I doesn't cost me anything to have those scriptures as my signature on all of my emails, but by doing this small thing, I have impacted a life. And I'm convinced that as each of us go through our days, we are presented with countless opportunities to impact another's life in a positive way, and many times, we will never be aware of the fact that God has used us to impact another. Are you in tune to these possibilities? Are you willing to accept the call? And that'll be all for now. Caleb is currently under the desk, trying to eat my jump drive. He's been very patient, don't you think? I'm getting ready for tomorrow...are you excited? Big bummer. My silly computer is doing silly things. But I'll have something for you. Here's a picture of Caleb helping make applesauce on Saturday. My feet hurt. The bottoms. Isn't that a strange place for feet to hurt? I wondered if it was due to flip flop usage, but I haven't worn flip flops in weeks, and my Dad wears flip flops more than I do, and his feet don't hurt, as far as I know. Just in the past few days my knee has started hurting, too. I briefly wondered if the knee was because of the feet--because I'm walking funny because my feet hurt, but my current favored explanation is that it's a crib injury. That's the knee I use to push in the side of the crib so I can put the side down. Scott's back has been hurting when he gets up in the morning, too. Wanna know what's really wrong with us? We're getting old. I haven't seen the latest life expectancy estimates, but according to the last one I knew about, I'm getting pretty close to middle age. I know that those of you a generation older than me who are reading this are now snickering, but it's true. My life is about half over. Gone are the days when I bounced. I have unexplained aches and pains. I no longer think that nothing bad is ever going to happen to me, in fact, I'm pretty sure bad things will happen, and I have no doubts as to my mortality. I am pretty clear on my purpose in life, so I guess I've got that going for me. And I suppose that my purpose goes along quite nicely with my present circumstance. There's a bit of a disconnect there, though. I'm not living and breathing my purpose with every moment, because I allow every day life to get in the way. I suppose that if I can get past that, my direction will become clear as well. We've reached the stage in Caleb's life where we're following him around with the camera, trying to get pictures of him walking. Some of you know what I'm talking about :-) He doesn't do it on command, though. So tomorrow, you may get a video or you may not (I know that you all have Wednesday marked on your calendars now, because it's library/video uploading day). I apologize--it's Ashwin Madia. I knew Madira didn't look quite right. And I saw an Al Frankin ad (Democratic candidate for Senate in Minnesota) during (you guessed it) The View. I must not be watching enough TV during the day...or perhaps he stepped up his campaign since there's less than a month to go. What is it with boys and socks? My kids' and husband's socks are awfully hole-y. I understand that my favorite brother in law goes through quite a few socks as well, while I still have socks in my drawer that were there in college (well, not in that particular drawer). I briefly considered the idea that maybe Scott's socks constantly need replacing because he has fewer socks than me, but I don't think that's the case. I think he has just as many or more than I do. It could possibly have to do with frequency of wearage, since I hardly ever wear socks during the summer, while the boys wear socks every day. Hmmm. Sometimes I will turn the TV on during the day, and I have noticed that only political candidates from the Republican party air ads during the times that I'm watching (even during the View!). Actually, I have seen ads for Ashwin Madira during the day, but he's the only Democrat. In the evening, the ad coverage seems to be about equal. This holds for both the national and the local candidates. So what does that say about how the political parties in the U.S. view people who watch TV during the day? I don't pretend to know the answer, but I find it interesting to speculate. And have you noticed the signs? They are all (all) blue and white. OK, some of them have some red along with the blue and white, and I think McCain-Palin has a little bit of yellow on their sign, but they are all blue and white. The only political sign that I've seen that is not blue and white is for Kitty! who is running for State Assembly. I have no idea who she is or what her platform is, but I'm tempted to vote for her just because she had the courage to be different.